… from time to time. Yeah, we have completely destroyed Blackburn with Michael Owen scoring twice. Our next game is against the mighty (and better that ManUre) Arsenal. My prediction is 2-1 for Liverpool. Let’s face it, Arsenal are down, feeling sorry for themselves and really questioning their own ability. They’re due to a ‘shocking’ perfomance. 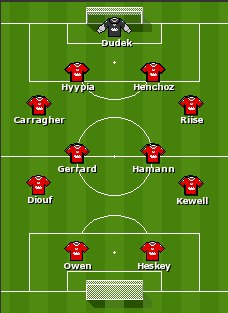 That’s why Liverpool’ll only lose by at least two… Logically I’d go for 5-0 Arses. Till then (last day of the season), it’s goodbye, God save Man Utd. Pas blié match zordi. Pé gagné en direct lor Sport+ (Canal Satellite ou Parabole Maurice) à 15:30 ek en différé lor MBC vers 17:00.